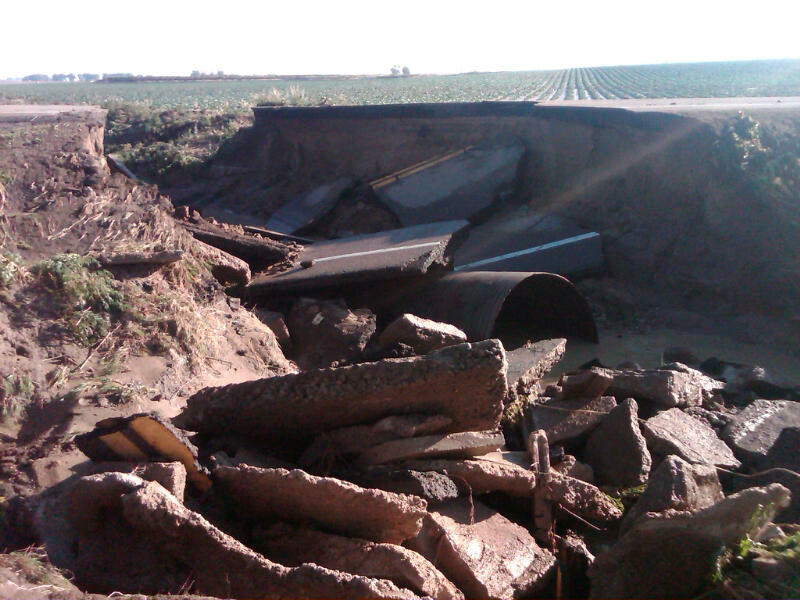 June 8, 2012 - TRAVEL ADVISORY - Northeastern Colorado/CDOT Region 4 - Highway was severely damaged during last night’s storm. WELD COUNTY — The Colorado Department of Transportation (CDOT) has closed State Highway (SH) 392 one mile east of Lucerne at mile marker 119 in both directions after roughly 30 feet of the highway was severely damaged during last night’s storm. Motorists must use alternative routes via local county roads. During the storm, a culvert that runs underneath the highway was ruined in addition a section of the highway roughly 30 feet long and as wide as the highway and shoulders. At this time, no traffic is able to utilize the road. Please see the attached photo of the damage. Crews will be working diligently over the next couple of days to make repairs to the roadway and are hoping to reopen the highway by Sunday afternoon. Motorists should plan extra time for their travel as alternative routes will be necessary, are reminded to obey all road signs and flaggers, and are urged to drive Slow for the Cone Zone. To receive real-time updates about road conditions in your area, visit www.coloradodot.info and click on the green cell phone icon in the upper right hand corner of the page. Updates are also available via Twitter @coloradodot and be sure to “Like” us on our new Facebook page at www.facebook.com/coloradodot.